Welcome to Robi Social Internet Pack Offer. Robi 80 MB Internet 5TK.. Robi Social Internet Pack Offer. All The Robi Connection customers use this Social Internet Facebook, Facebook Messenger, Circle App, Whatsapp Messenger. To activate Robi Social Pack 80 MB 5 TK Offer 2017, Customers need to Dial USSD Code *8444*080#. Customers can use the Robi 80 MB Social Pack only Facebook, Facebook Messenger, Whatsapp Messenger, Circle App. The validity of Robi Social Internet Pack 80 MB Internet 7 days. Customers use the robe 80 MB @ 5 TK Offer 2017 both 2G/3G Area networks and uses times 24 hours. To check the remaining balance of Robi Social Offer 80 MB Internet, just dial *8444*88#. Finally, we hope that you have understood about Robi Social Internet Pack Offer 80mb Internet 5TK. 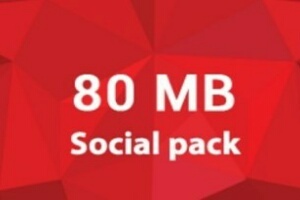 DO you have any question about Robi Social Internet Pack Offer 80mb Internet 5TK, just comment here? We will try to solve your problem very soon. Thank you for staying with us.